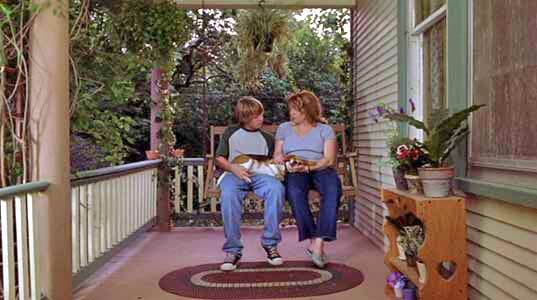 Jason Dolley wears black high top Converse “Chuck Taylor” All Stars in the film. Marty and Shiloh talk to Mrs. Wallace. 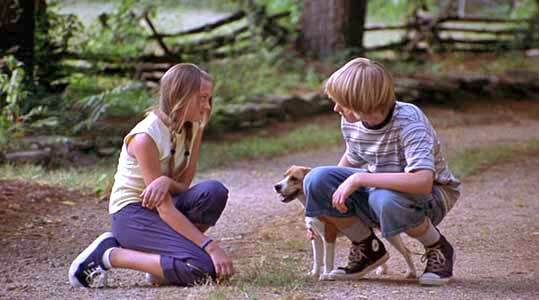 Saving Shiloh is the third film in the series of family films revolving around a young boy named Marty Preston and his beagle dog Shiloh. The films are based on the books by Phyllis Reynolds Naylor and the setting is a small river town in rural West Virginia. Each film has used a different actor to play Marty, and in this film Marty (Jason Dolley) is now about thirteen. The film opens with shots of the countryside and then some narration by Marty that reviews the previous films. The main focus of the film is the relationship between the Preston family, and their neighbor Judd Travers (Scott Wilson). Judd is a quintessential redneck loner. He lives by himself and has a bad reputation in town due to his problems with drinking, fighting, and inability to get along with other folks. 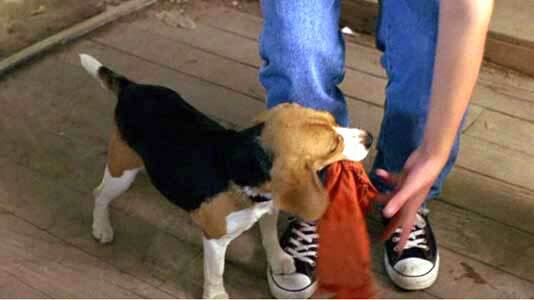 Marty’s dog Shiloh was rescued in a previous film from Judd, who treated the dog in an abusive manner. We also learn that after a recent truck accident, Judd seems to be mellowing out a little bit, and Marty thinks that he has reformed. Next we meet the rest of the Preston family. Besides Marty, there are two younger sisters Dara Lynn (Kyle Chavarria) and Becky (Liberty Smith), his mother Louise (Ann Dowd) and father Ray (Gerald McRaney). Their lives are very simple and family oriented. Louise is a stay at home mom and the kids often play together, although there are the usual sibling rivalries. The parents are level-headed and involved with their children’s lives. The family eats together and goes on trips to visit relatives, like Marty’s grandmother who is beginning to show the signs of Alzheimer’s disease. The Preston family even watches television together. There is no sign or mention of Ipods, cell phones, personal assistants, computers, sports or other gadgets that permeate our urban culture today. Although nearly every character in this seemingly pristine world is white, give the casting director credit for at least casting a minority actor to play veterinarian Doc Collins (Adrian Rice) the one white collar professional appearing in the film. This reminds us that although this seems like the 1950s, it really is taking place today. The story line proceeds at two levels. On the first level, Marty and his friend David (Jordan Garrett) discover a wrecked car while wandering arouond in the woods one day. The sheriff is contacted and soon they find out that the car is registered to man who has recently disappeared. The last time the man was seen in town, he was in a bar having a fight with Judd. David is sure that Judd is somehow involved; in fact he believes that Judd killed the man and hid his body somewhere nearby. Many of the townspeople and even Marty’s sisters think that Judd is guilty. But Marty’s dad Ray, although he doesn’t particularly like Judd, thinks he is incapable of the crime, and Marty agrees with his dad, even though he has had run-ins with Judd in the past. The second level of the story is Marty’s personal campaign to bring Judd out of his shell and develop better neighborly relationships. Shiloh will have none of this, and when Marty and he arrive at the narrow bridge to Judd’s property, Shiloh refuses to cross it, or get anywhere near Judd. 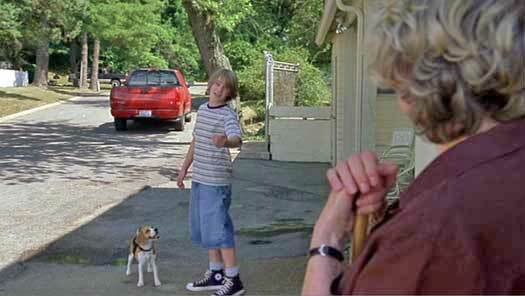 So Marty continues alone to Judd’s house, and tries to be friendly and also convince him to put up a fence on around his house, so he won’t have to keep his dogs chained up all the time. Doc Collins has told Marty that chained dogs are unhappy and mean and he tells Judd that he and his dad will help him put up the fence. 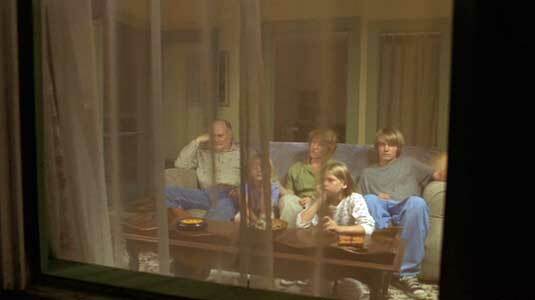 Marty and his family watching television. Back in town, the mysterious crime wave continues. A series of home break-ins has people on edge, and their first thought is that Judd is somehow responsible. Marty still backs up Judd when the discussion of his guilt or innocence comes up, and his teacher at school backs him up, reminding the class that one of the cornerstones of the legal system in America is that people are considered innocent until proven guilty. Eager to try and clear up the mystery, Marty decidesto investigate things for himself along with his friends David and Samantha (Taylor Momsen). When Marty discovers a boot near the scene of the disappearance, it turns out that it belongs to Judd, putting more suspicion on him again. Although Marty remains the eternal optimist, the police end up taking Judd and questioning him. Marty and his friend pursue a lead in the mystery. While it would spoil the impact of the film to reveal any more plot information, suffice it to say that there are some interesting twists and turns in the plot that happen because of Marty and his friends pursuing their investigation. A story line built with simple ideas and characters ends up relying on those characters remaining true to their beliefs. In the end the truth wins out and you learn where the title of the film comes from. Marty talks with his mom. 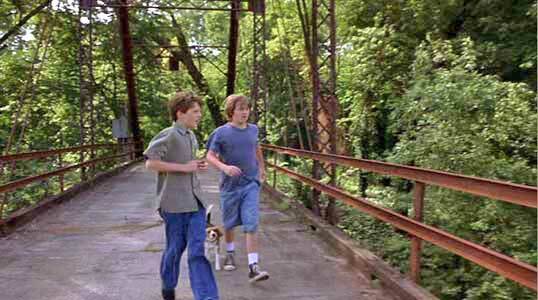 Saving Shiloh on the surface is a film about a boy and his dog, but the film takes advantage of its status as a family film to deliver some other messages. One is that kids can make smart decisions if they choose to think about things. We see a lot of this trait in the character of Marty. Another message is that kids can be happy without a lot of things if their parents are involved in their lives, treat them fairly, and help them understand the differences between right and wrong behavior. The film also reminds us that we should all take time out of our lives to help out help out elderly people and show respect to the dead. The Preston family takes time out on a weekend to visit Marty’s grandmother at a nursing home. Marty and Sam visit the grave of her grandfather, Doc Wallace, who was also beloved by Marty. While this behavior might seem too good to be true, most of the time we see the kids in the movie living ordinary lives, playing and teasing each other, and showing the typical sibling rivalries of young brothers and sisters. Jason Dolley gives a fine performance as Marty, and by the end of the film you really begin to care about him, his friends and family. Probably the most interesting performance comes from Scott Wilson in the role of Judd, the grouchy neighbor and presumed bad guy. In most family films, the bad guys are usually nothing more than caricatures, but in Saving Shiloh, Wilson delivers a nuanced, low key performance that makes him a believable, if misunderstood character. In fact the over all film maintains a low keyed approach, even during the dramatic parts, which makes it a great film for younger kids, but perhaps a little bland for the average teenager today. But on the other hand, the film gives you a glimpse into a life style that many teenagers might wish they could have, a simple life, with a supportive family life, and little of the pressures that so many teens experience in today’s world. Marty helps his younger sisters get ready for bed. Someone tries to get Shiloh’s attention. Jason Dolley as the lead character Marty wears black high top chucks throughout Saving Shiloh, usually with denim shorts or jeans and tee shirts. In this film they remind you how black high top chucks have been the shoe of choice for so many typical American kids, and how cool they look. The camera work by Lex du Pont in this film is particularly chucks friendly, and you see them nicely framed in most of the shots. The best closeup shots occur when the camera focuses in on Shiloh when he is with Marty. Shiloh brings a clue to Marty. Saving Shiloh. (2006) Jason Dolley, Scott Wilson, Ann Dowd, Bonnie Bartlett, Jordan Garrett, Liberty Smith, Gerald McRaney,Taylor Momsen, Judd Travers. Directed by Sandy Tung. Categories: Drama, Family.